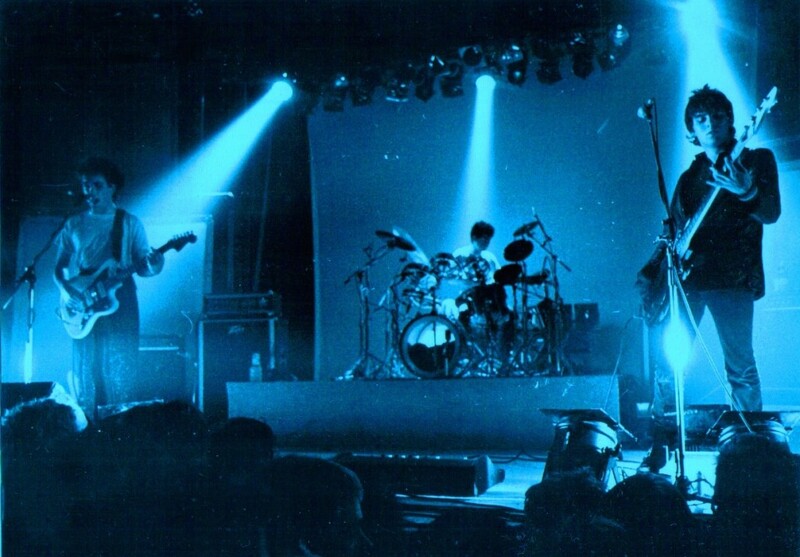 In their pretty brief existence, The Cure had already performed hundreds of shows, only within a couple of years. They had been playing the English and European club circuit multiple times. 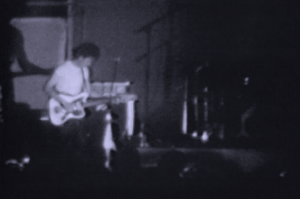 By the last quarter of 1980, when they were trying out new songs live for the next album Faith, the band were becoming a bit tired of playing the same bleak venues with poor acoustics over and over again. The idea arose to play in less obvious and more atmospheric places, like old buildings or churches (which would have suited their new songs quite well I think). A church tour appeared to be a bridge too far. 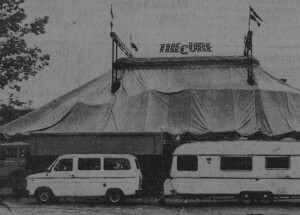 However, Dutch impresario Fred Zijlstra was willing to think along about a different approach and came up with the circus tent, which idea actually originated from his co-organiser Frans de Bie. The Cure were in to try something new. In this interview you can read some more background information about how the circus tent idea took shape. The crew that travelled along with The Cure on the Circus Tour consisted of about 30 people. Besides The Cure’s own road crew, there were young Dutch men and women among them, who basically volunteered to build up and break down the circus tent every day, mostly for the adventure. Not only the concert venue itself needed to be built up from zero on the empty grass fields where The Cure Circus called at. After the tent had been constructed, the stage had to be set up, then the PA system (hired from Pink Floyd), the lights, projectors and screens, a bar and a merchandise stand. On the Dutch roads of June ’81 a lot of people must have driven past this remarkable Cure Circus convoy with several trucks, cars, caravans and a mobile cash desk. Food for the crew had to be prepared on-site and could be eaten in the canteen bus. Early in the tour the toilet vehicle broke down, one of the reasons why the band themselves (wisely) chose to stay in hotels. Each night the tent would open at 7pm. The program started at 8pm with the screening of the animation film Carnage Visors. After that The Cure would perform a show of about 1,5 to 2 hours. Despite that the 21st of June marks the beginning of Summer in the Northern Hemisphere, the last ten days of June 1981 were everything but hot, dry or pleasant holiday weather. Call it a typical Dutch Summer, with a lot of rain, wind and rather chilly temperatures. Obviously these conditions had more impact on the whole entourage than usually, because this leg of the Picture Tour had quite a camping feel to it. But by going through this ‘ordeal’ together, the travelling companions developed a very special bond. 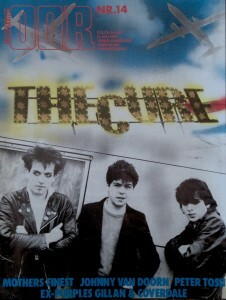 By June 21st 1981, The Cure had already played over 50 shows on the Picture Tour. They kicked off mid-April with an extensive UK tour, did a couple of shows in Ireland and then travelled to Belgium and Germany, almost without any days off. The night before Amsterdam, The Cure had played in Essen in the Ruhr area. From there it must have been about a 3 hours drive to Amsterdam in those days. Initially the concert was planned to take place at the Oude RAI premises, but for some reason it was relocated to a field at the Jan van Galenstraat, close to the Erasmus Park. The Amsterdam show is supposed to be filmed, at least partially. 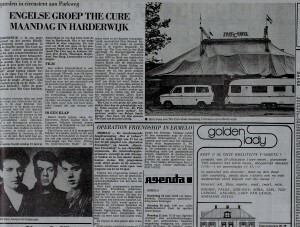 The Super 8 footage outside the circus tent and bits of The Cure live (with studio audio of Doubt as soundtrack) included on the 1986 Staring At The Sea VHS (in between the Primary and Other Voices videos) have reportedly been shot in Amsterdam. In The Cure’s official biography Ten Imaginary Years it is mentioned that June 21st 1981 was the day Lol’s mother passed away. According to this book he received the sad news during the concert (backstage, after the main set) in Sittard (see below), which was three days later. I guess it might be possible that in their memory they have swapped some dates in hindsight. Maybe Lol got this message in Amsterdam or in Harderwijk the next day? On the right is a snippet from a local newspaper announcing the gig. On the same page there is a little article honouring the candidates from a near village who had just obtained their type writing certificate! The gig in Arnhem is the first one on the Circus Tour of which a live recording is circulating. It is striking how the band sounded like a well-oiled machine at this stage, which is no wonder given the huge amount of gigs they were doing at the time. With Lol’s excellent tight, mechanical drum beats, Simon’s note perfect bass lines and Robert’s meandering chord strokes and echoing voice, The Cure had created a unique style of their own, recognizable among thousands. The set was being built up with quite slow and atmospheric songs, starting with the trio The Holy Hour, In Your House and The Drowning Man. You can hear that as of the next song 10:15 Saturday Night the crowd is getting on its feet, singing and clapping along. During the intro of A Forest, when Lol starts the beat, the crowd goes ‘Hey! Hey! Hey!…’. Sittard, a small city in the Province of Limburg, in between the borders of Germany and Belgium, was the southernmost date on the Circus Tour. Here the gig had been organized in cooperation with Jan Smeets of Buro Pinkpop, who would also book The Cure as headliner for the Pinkpop Festival editions of 1986 and 2012. Again, due to a tight schedule of many similar concerts and clouded memories it still may be possible that this all did not happen in Sittard but somewhere else that week. Anyway, these must have been very difficult and emotional times for Lol and the band, only aged 22 at the time. The decision of Lol to keep touring under the circumstances, travelling back and forth to England in one day and performing again the same night, shows how passionate and dedicated he was for The Cure. 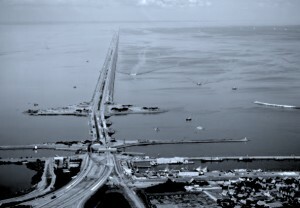 Next stop on the Circus Tour was Vlissingen, a port in the Province of Zeeland. A place not very often visited by foreign bands to play live. 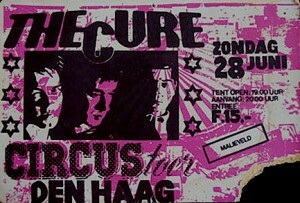 The music of The Cure isn’t quite cheerful and the lyrics do not expose the most happy sides of existence (the group is being regarded as part of the ‘doom-division’ of pop music), but the response of the Vlissingen audience in the packed and scorching circus tent negated this opinion in all respects. 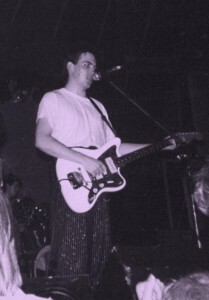 Initially the performance was full of dreary and mystic atmospheres, which are so characteristic for The Cure, but towards the end of the concert it became more and more a musical happening, in which the audience reached the boiling point when the first tones of the hit ‘A Forest’ resounded. Then the performance couldn’t be better and the the group was being called back for two encores. Rotterdam – the Circus Tour of the English pop group The Cure across the Netherlands is at least in one respect a great success. Commercially, the expensive ten-day trip surpasses all expectations. Every place where the caravan chooses to bivouac, the enormous tent is full. That was also the case last Saturday night in the park next to the Euromast. Almost 2.000 fans experienced an alternative pop night with the trio from Crawley under the canvas. Also musically speaking the concert was very successful. Starting-point of this tour for The Cure was a better sound in their own tent, in which they had rehearsed extensively, instead of the usual slogging in all kinds of inconvenient little rooms. The repertoire, selected from four LP’s, could be heard superbly and was brought at the right volume (also for the surroundings). That also applied to the music of “Carnage Visors”, the half an hour film experiment of the group, which served as support act. However, the images were shadowy, most of the visitors hardly knew how to deal with it. Also because the screen was too small and invisible for the vast majority of the standing crowd. Not being able to sit down and the lack of ventilation in the boiling hot tent during the 2,5 hour lasting performance obviously dropped the enthusiasm for the receipt of the flawless gig. Only on some occasions, such as during the hit “A Forest” of last year, the spark passed on from the stage to the room. Singer-guitarist Robert Smith, bassplayer Simon Gallup and drummer Lol Tolhurst (who travelled back and forth to England to take leave of his deceased mother on one day last week) didn’t seem to care about the lukewarm response. As the performance progressed, a bigger problem became the lack of sanitary. The toilet vehicle was broken, so all those in need were obliged to hold themselves or to seek sanctuary in the bushes. The rain during the day already had got the heavy trucks into trouble on the lawn. The downpour of yesterday morning meant even more struggle to get the rolling stock back on the road. There were no further incidents during the concert evening itself. The concert in Den Haag (The Hague), the seat of government of the Netherlands, was held at the Malieveld. This is in the centre of the city, opposite the Central Station. The Malieveld is mostly known for political demonstrations. As far as I know, there is not much audio or visual material preserved from this particular gig, except for this worn ticket. The concert tickets for the Dutch leg of the Picture Tour all had the same layout in Cure Circus style, but with different colours for each city. Obviously that night it must have been raining heavily as well, since Lol told Oor-reporter Paul Evers that drops were falling from the roof of the tent onto his cymbals. According to the same Oor article, it was in Den Haag that the crew lost the keys to a bus and a caravan, forcing them to leave these vehicles behind. From The Hague the Cure convoy drove via the Afsluitdijk to the North-East of the Netherlands for the last two shows of the Circus Tour. On the Afsluitdijk, which is basically a dike between two (inland) seas, it can be quite windy and the Cure-logo was blown off a truck. Also in Leeuwarden it was stormy weather. Paul Evers wrote in Oor that the canvas was flapping and the tent masts were swinging frightfully. That night Robert apparently was annoyed by some people in the audience. He told Oor: ‘After the third song a couple at the front stood there screaming all the time “I hate rock ‘n’ roll, I hate rock ‘n’ roll!” and I thought: for God’s sake, how can you call The Drowning Man rock ‘n’ roll, without being a reactionary? I got very angry and told them to shut up, instead of ignoring them, what I usually do. During Three, the last song of the encores, I put down my guitar and turned up all the effects. Just when I was about to jump in the room, they were gone… I got really angry you know, because you definitely cannot say from us that we’re rock ‘n’ roll (…)’. In retrospect, I guess it may be possible that the couple was just referring to Robert’s own joke at the Countdown Live festival, the year before in Amsterdam on 17 October 1980. The band arrived late that night and had to soundcheck in front of the audience. Robert said that because it’s nice for everything to have name, he called the soundcheck I Hate Rock ‘n’ Roll (that show was broadcasted on Dutch radio and part of it on TV). Originally the final date of the Circus Tour was planned to take place on the corner of the Korreweg and Bloemsingel. But the municipality of Groningen decided last minute to allocate the Stadspark for the show, more far away from the city centre. They expected there to be less excessive noise. There was some delay in the planning, because the truck carrying the tent didn’t fit under a little bridge when it entered the Stadspark. Paul Evers wrote in Oor that, in accordance with tradition at the end of a tour, the crew played a couple of tricks on the band. At the start of A Forest, a tape would play the sound of a tree felling and a jacketed waiter would come to provide the band with wine. In addition, they would throw mackerel, fishes on sticks and attached to ropes would be pulled through the group and beer would be sprayed from aerosols. For the first time, Paul Evers wrote, he saw Robert Smith laughing on stage. Thus ended the successful and legendary Circus Tour. The day after Groningen, The Cure probably went back to England. But only a couple of days later, on 4 and 5 July 1981, they were on the continent again, playing the Torhout – Werchter Festival in Belgium. You can read a full English translation of the very nice Oor article about the Circus Tour on Pictures of You.